One evening in 2013, a French woman named Sylvie was alone in her home, staring at her computer screen while her husband Patrick was out with their children. She was watching a documentary that her daughter's godfather had told her about called A Childhood in Exile, which concerned a tragic yet little-known episode of French postcolonial history. "From the first bars of music and the [first] archival images, I understood that this was my past that was being told to me — it was obvious," Sylvie recounted. "Tears started streaming down my cheeks." Standing in her apartment overlooking the port of Toulon on the south coast of France, Sylvie told VICE News that the film was the key to a mystery she had been trying to solve for decades. Watching the documentary, she finally understood what had happened to her 45 years ago, when she and other children were snatched from the island of Réunion — a French overseas territory in the Indian Ocean — and sent to the mainland for a new life. Today, this tragic chapter of French history is finally being investigated by the Ministry of Overseas France. Sylvie, who was born in 1967 and is known as "Sissi" to her friends, is one of at least 1,615 children who French authorities removed from the island and resettled in mainland France. The purpose of the resettlement was to help populate the country's rural areas, such as the Creuse department in central France, which were largely uninhabited. Some of the children who were resettled were orphans, but many others, including Sylvie, had been snatched from their parents. "They didn't give my biological mother Adrienne a chance to keep me," she said. "On the grounds that my mother was poor, a friend reported her to the DDASS [Departmental Directorate for Health and Social Affairs] for instability and poverty," she explained, adding that her mother "really loved her children" and that there was "a lot of love" in the household. The "friend" in question was actually the wife of Sylvie's biological father, demonstrating for Sylvie that "the 'metros' [residents of the metropole] were not the only bad guys." "I was then placed in a nursery run by nuns with my older brother, Jean-Bernard," she remembers. "My mother tried to come and see us at the nursery to take us back, but was never able to. They refused because she didn't have a job. Some women were prevented from getting their children back just because they smoked." "After that, me and JB [her brother] were flown to the mainland," she continued. The year was 1971, and Sylvie was three months away from turning four. Her brother was a year older. Neither of them ever saw their birth mother again. The resettlement scheme was the brainchild of Michel Debré, a prominent French politician who played a major part in the writing of the constitution of the Fifth Republic and became its first prime minister. He served as a deputy for Réunion from 1963 to 1988. Debré hatched the scheme when he took office on the island, explained French sociologist Philippe Vitale, who heads the Committee on Children of the Creuse. "Too many young people were leaving rural areas on the mainland, such as the Creuse, Tarn, and Lozère [departments]," Vitale told VICE News, "and at the same time, Réunion was struggling to keep up with a demographic boom." Debré believed the island's rapid growth posed a threat to its future. His solution was simple enough: resettle individuals from the impoverished island to the mainland. In 1963, "Papa Debré," as he was known to the islanders, set up the BUMIDOM (Office for the Development of Migration in Overseas Departments) to organize the relocation of adult islanders, who were promised a better life on the mainland. But willing adults weren't the only ones that ended up taking part in the scheme. Young islanders were also resettled, but authorities kept quiet about those transfers. Working closely with the DDASS, the government organized the movement of islanders to the depopulated interior known as the "French desert," including children between the ages of six months and 21 years who were born to poor families on the island. Some of the children were forcibly removed from their parents, who never consented to their resettlement, and their files were later found to have been forged by the authorities. "Adrienne didn't know how to read or write," Sylvie said of her mother. She doesn't believe Adrienne knowingly abandoned her children. "All of these children's files were forged. For example, I know children who were born twice according to their file. Once in Réunion, and then again on the mainland." Vitale said that officials lied to parents to convince them to part with their kids. Many ended up working as farmhands or servants for French families. "They were told that their children would be temporarily taken care of, long enough for them to get back on their feet," he explained. "But a year later, when they wanted to get their children back, the children were already far away on the mainland, without any possibility of returning." Félicien, Sylvie's biological father, spent a good part of his life trying unsuccessfully to find his two missing children. This shameful chapter has left indelible marks on the lives of hundreds of children who grew up into lost adults. Vitale, who has met many of the 1,615 children who were sent to the mainland, described the people he had met as "broken by this history." A number of them, he said, "burst into tears when they tell their story." Sylvie and her brother landed in France on February 6, 1971. While her memories of the day are somewhat vague — she was not yet four at the time — Sylvie does remember arriving at Orly airport stripped of the clothes she had been wearing, which had belonged to DDASS. At the airport, she and her brother were introduced to a man and a woman. "Hello sir, hello madam," she recalls whispering, only to be told that, from now on, she would address them as "Mom and Dad." The children and their new parents then headed to the western city of Lorient, in Brittany. The couple had decided to adopt after losing their first child, who died before he turned one. Christian, the husband, was the driving force behind the adoption, while his wife Claudine was initially reluctant. After the death of her adoptive mother, Sylvie found out that Claudine had requested "children that weren't too black." "I didn't have a mother but an educator," Sylvie remarked, noting Claudine was extremely strict and frequently disciplined her children with violence. "But JB was always there to protect me. Once, he even punched my mother when she was about to hit me." Christian spent much of their childhood chasing other women before being diagnosed with cancer. The family situation quickly deteriorated when he became too sick to work, which forced Sylvie to hold two jobs. During that time, the children often bore the brunt of her frustration, with Sylvie relying on JB for protection. But in 1979, JB was sent to boarding school and 12-year-old Sylvie was left alone with her parents. In the years that followed, things got darker. One night, when Sylvie was just 14, she was home alone with Christian. "I was used to sleeping in my parents' bed when I was little," said Sylvie, her voice hesitant before a lengthy pause. "Let's just say that I never should have." Sylvie never told her adoptive mother that Christian had sexually abused her, and informed JB only last year. Throughout her difficult childhood, Sylvie always felt there was a missing piece of her history. Christian and Claudine were equally unaware of the government's scheme. Sylvie and JB were told that their mother had put them up for adoption. "But I always knew something wasn't right — I just didn't know what," she explained. She started her sleuthing at the age of 20, when she contacted an official at the town hall in Saint-Denis, the administrative capital of Réunion. The government worker was able to provide her the name of her biological mother, Adrienne. "I was finally told who my mother was," she remembers. This clue sent her on tireless quest to shed light on her background. Years later, in 1998, she discovered that her mother had never signed an adoption deed. By then, both of her biological parents had died. Over the course of countless trips back to the island, Sylvie learned that she and JB were two of 11 siblings. She met some of her brothers and sisters, discovered island culture, and learned Creole. Little by little, a clearer picture started to form. The documentary, she explained, was the final piece of the puzzle. All these discoveries sent Sylvie into a deep depression — so deep, in fact, that she has had to give up her job as a home nurse. 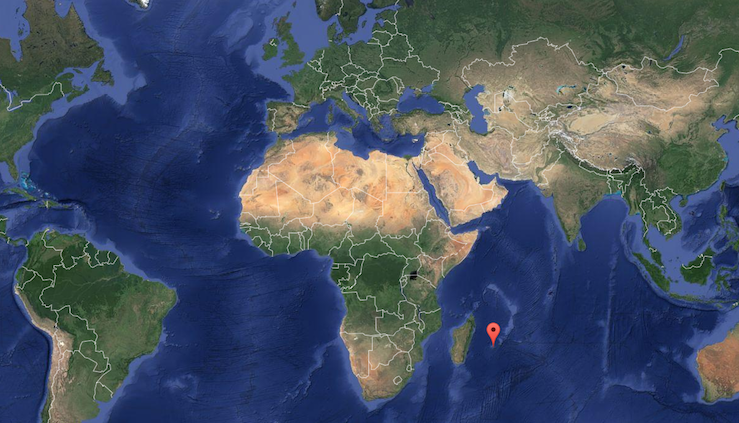 Today, the only place in the world where Sylvie feels truly comfortable is the island of Réunion. She and her husband Patrick are hoping to move there once she feels better. They hope to be living on the island by 2017. "I want to try and live there for a year," she said, her face lighting up. "I want to know what it's like to live there." "When I'm there, I feel like a fish that's been put back in its tank," she remarked. "Here, aside from my children and grandchildren, life is bland." Sylvie has paid for her trips to Réunion herself, but she hopes that the government will eventually provide financial support to those like her who wish to visit or relocate to the island from which they were snatched. In 2014, the National Assembly voted in favor of a resolution to raise awareness over the resettlement scandal and to do "everything in its power to help former wards [of the state] reconstruct their personal history." "It's a resolution," Vitale noted, "not a law. It's purely advisory." For Sylvie, returning to Réunion is the natural next step. "I don't feel like I'm from Brittany or from Toulon," she said. "I am very angry at this system, which decided for me that I would be happier somewhere else. In doing this, France destroyed lives, massacred families." Next year, Sylvie will turn 50. She intends to spend the rest of her years on the island. "Once I'm there," she declared, "there'll be nothing else I need." This article originally appeared on VICE News' French edition.